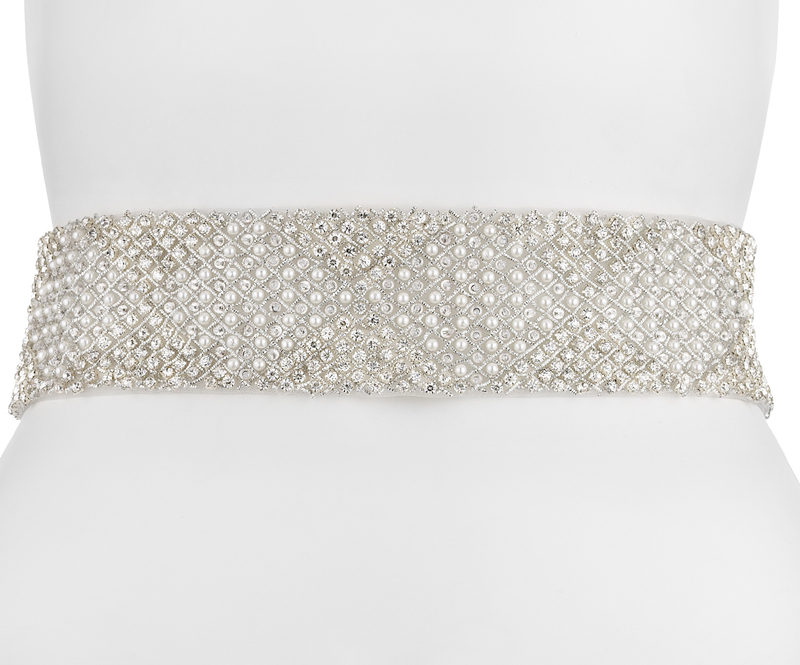 Intricately beaded or sleek and minimal, our belts offer an instant way to bring texture, radiance and glamorous properties to your wedding day aesthetic. Our belts and sashes are the ideal accompaniment to timeless bridal corsetry, enhancing the silhouette to perfection. All belts are lavishly handcrafted to deliver addition luxurious excellence to your unique look. Exquisitely constructed black beading is glamorously positioned on the petals of the floral motifs that gracefully unite to form this luxurious AMARA belt. Eveningwear can be elevated with this opulent waist-cinching, eye-catching waistband. 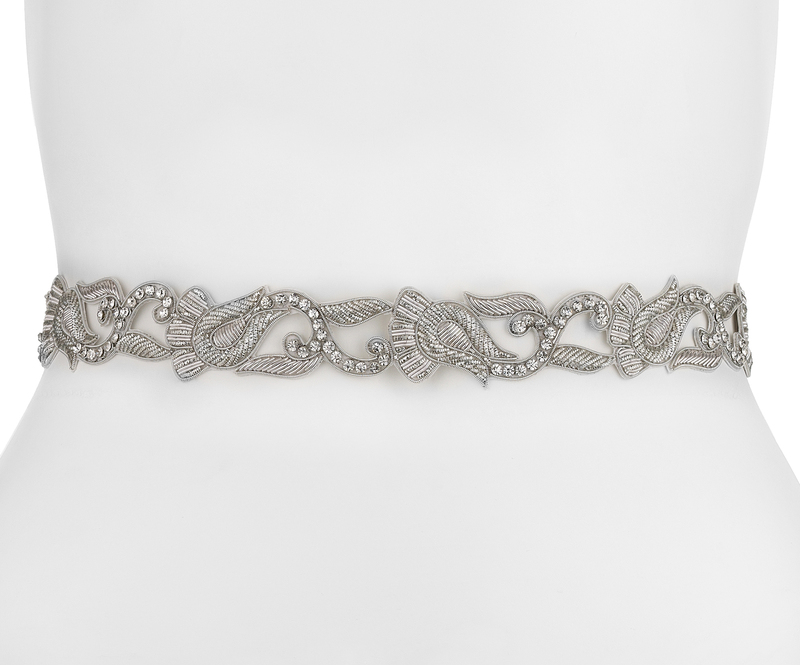 Echo the vintage appeal our ANGELIC belt is influenced by, with this narrow striking silverwork waistband. Comprising a plethora of beaded craftsmanship intermixed with opulent artistry and shimmering Swarovski crystals. 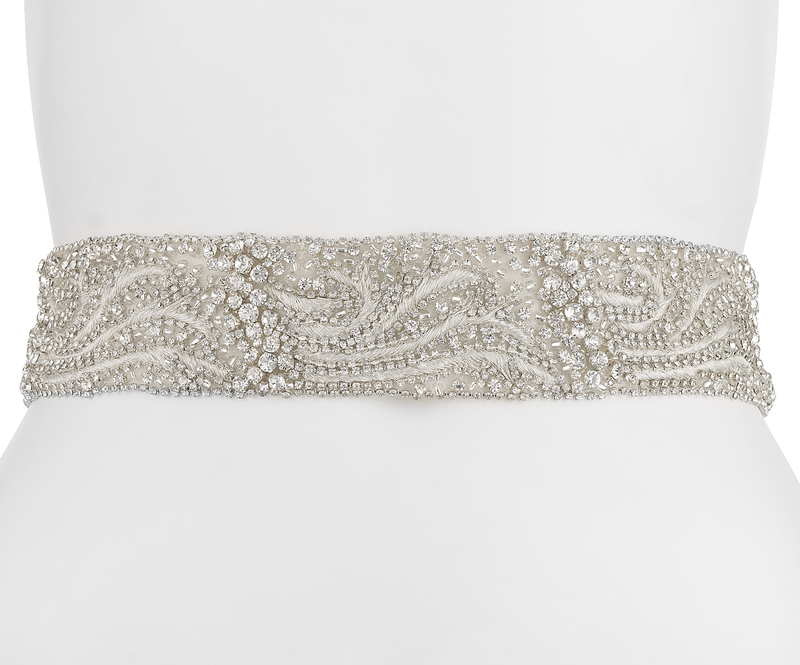 Evoking nostalgic emotions, the vintage aesthetic of this celestial beaded belt is evident and the ultimate addition to enhance a bridal silhouette. Bringing opulence, elegance, premium appeal and waist-enhancing properties, BELLE BEADED SASH comprises a plethora of vintage beading stunningly set on a 50mm ribbon. Captivating enhancements add a modern aesthetic to the bridal silhouette. 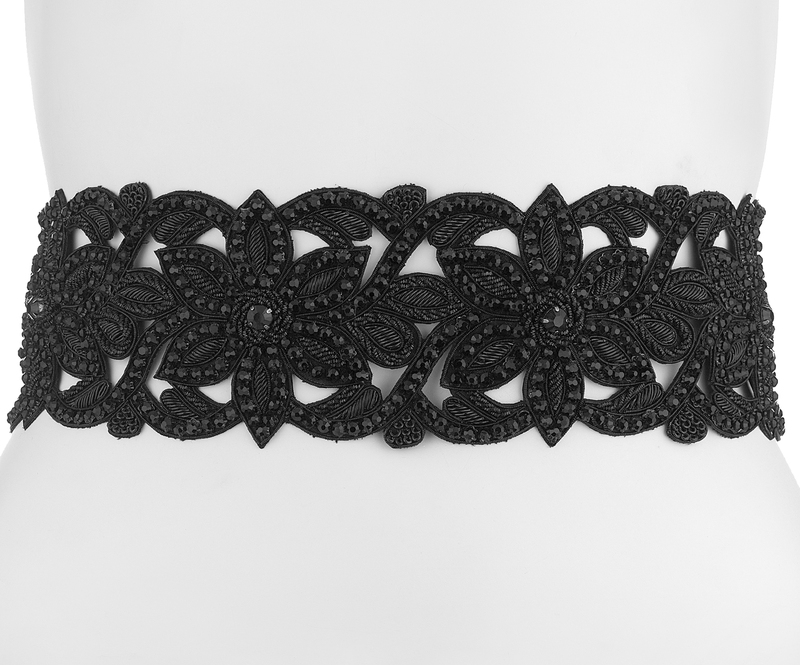 Our intricately beaded CAMILLA belt brings opulence, luxury and decadent charm. 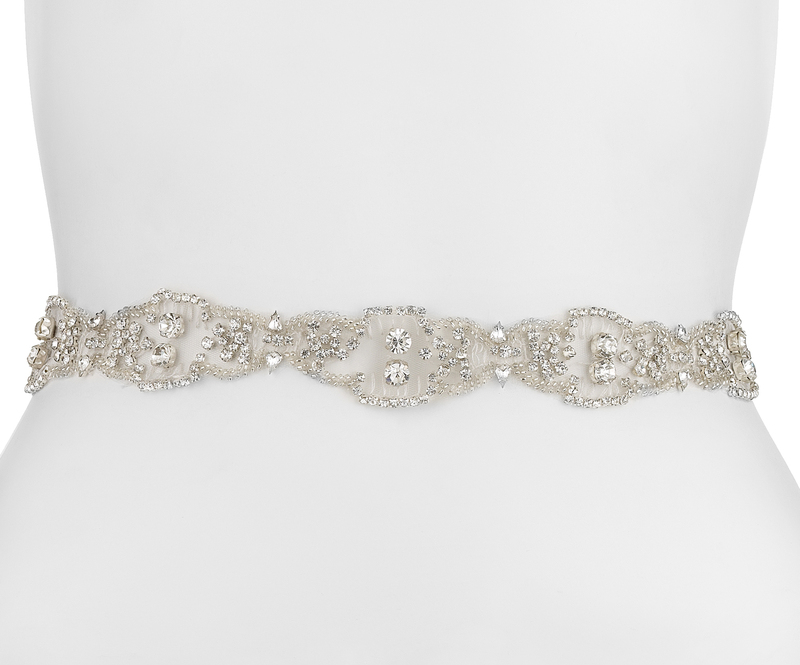 Through skilled artistry, this delectable waistband has been beautifully constructed with translucent beading, crystal segments and stunning silverwork. Eternally exquisite and the epitome of grace and elegance, a meticulously handcrafted beaded belt will instantly elevate a wedding dress silhouette. Comprising an array of gleaming diamante and crystal beads, the charm of old Hollywood glamour is infused into this delectable 35mm embellished ribbon waistband. 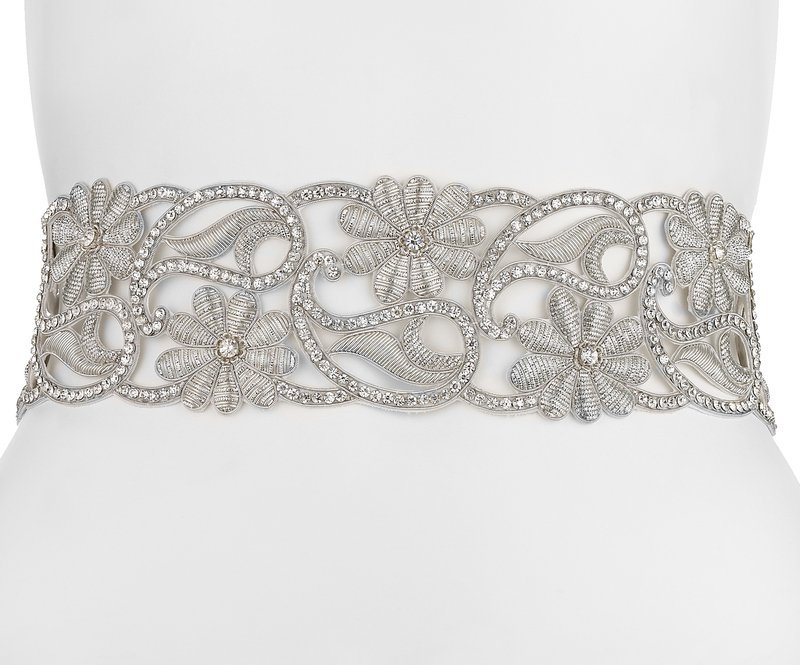 Exquisite embroidery meets delicate beading, pearls and mesh in this floral motif vintage bridal waistband. 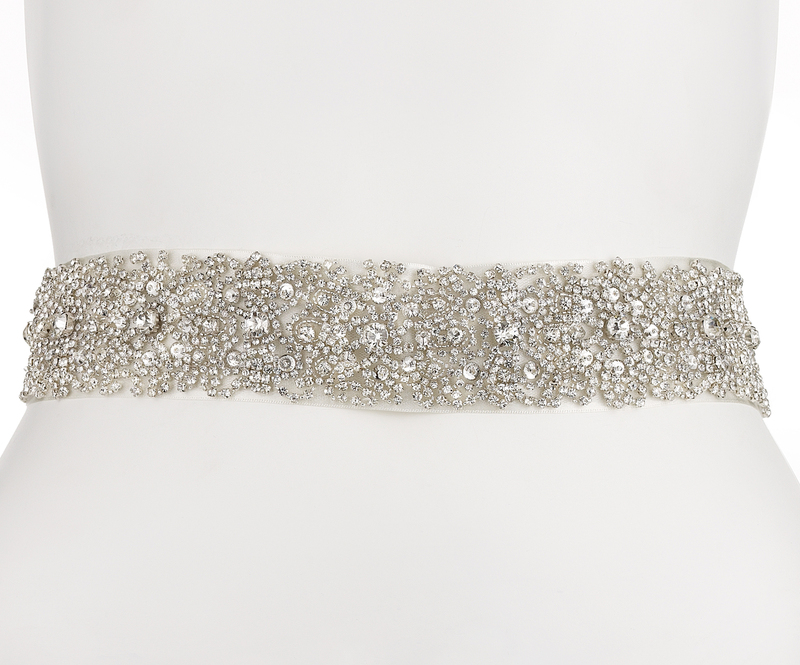 Mesmeric and meticulously made by hand, this luxurious belt will bring a new dimension to any designer bridal gown’s silhouette. Meticulously handcrafted to catch the light as you move, our FLAMBOYANT belt reflects and refines. 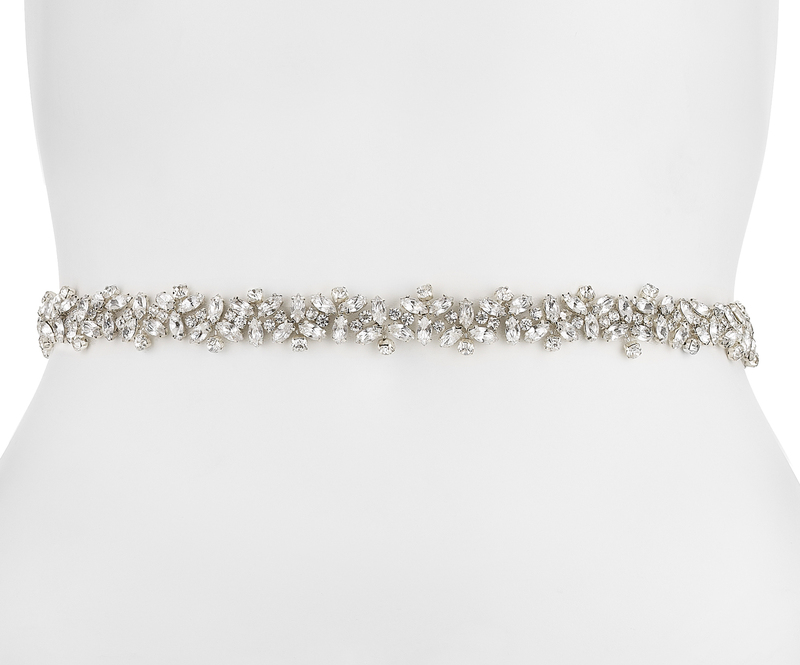 Luxurious beading is amalgamated with diamante and pearl diamond delicate segments, resulting in a glamorous wide silver belt, guaranteed to add vintage charm to your bridal aesthetic. Ever enchanting, a bride wearing this majestically GARBA beaded belt will catch the light and sparkle onlookers as she moves. 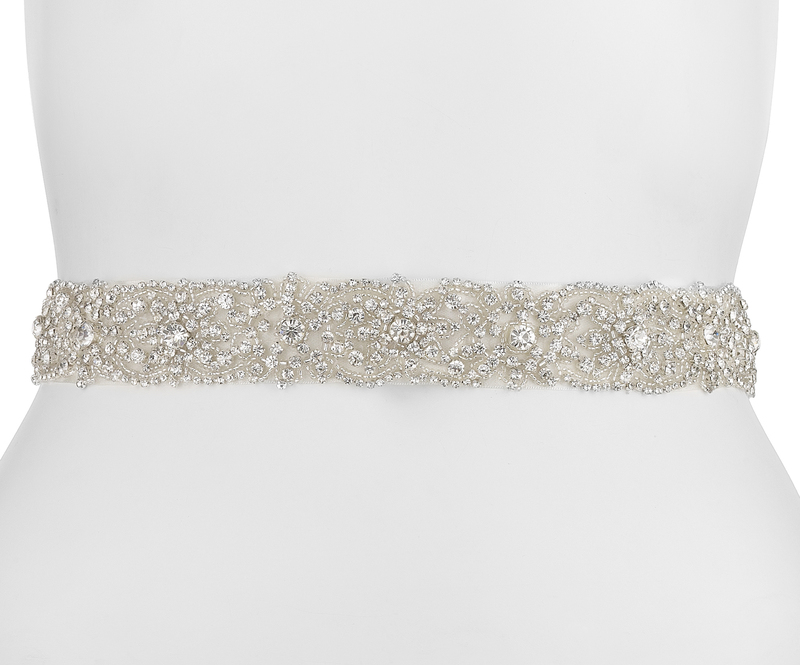 Impeccably handcrafted to deliver opulence and glamorous, gleaming properties, this narrow wedding belt comprises large circular beads alternated with smaller translucent segments, arranged on a floral setting. Beautifully handcrafted and delicately designed to portray glamour and vintage appeal. 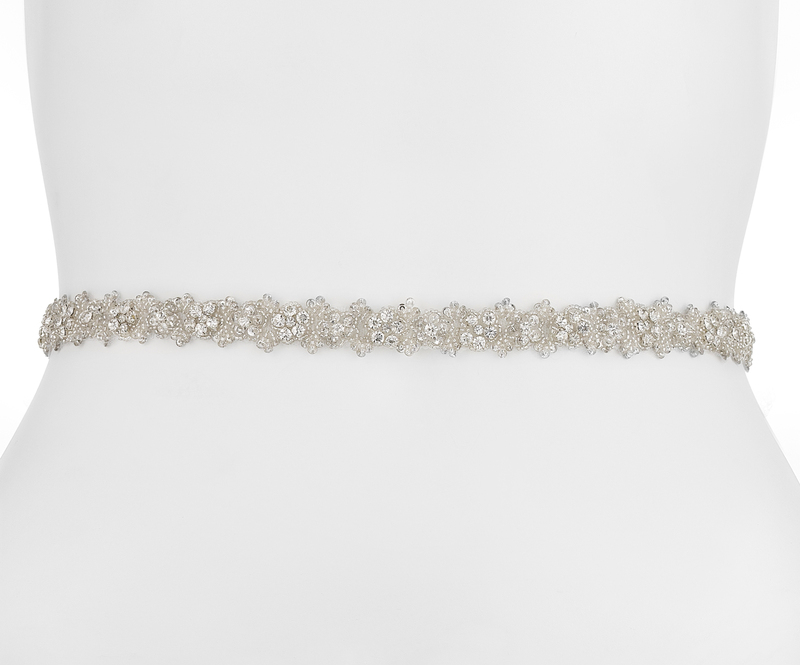 Mesmerize in glitzy diamante and pearl diamonds, exquisitely embroidered onto a 35mm silk ribbon. 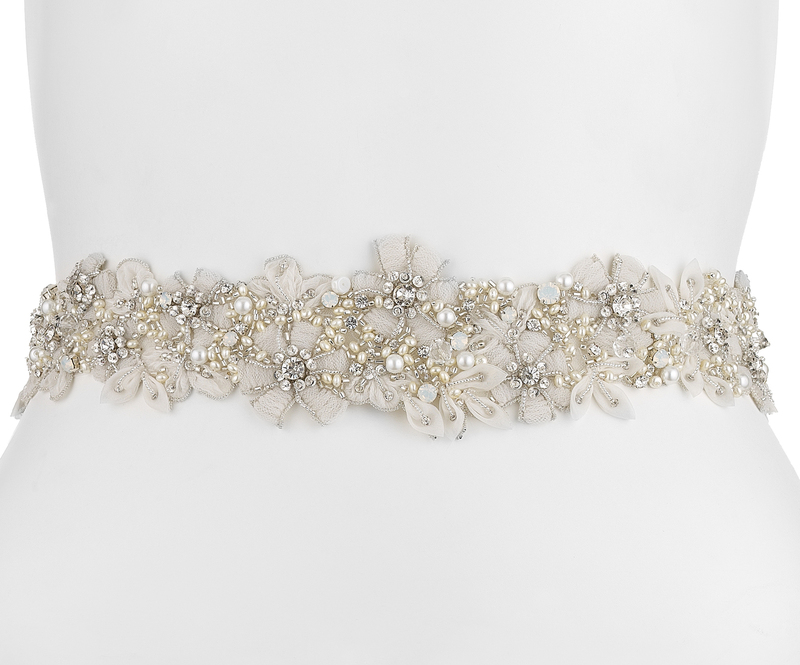 A beaded belt will provide a powerful pinnacle point in your bridal aesthetic. Delivering decadence and vintage appeal, our gleaming wide HEAVENLY belt offers the ultimate power piece to unite your bridal corsetry with full, pleated wedding skirts. Exceptionally handcrafted silverwork is designed into a swirl and floral motif pattern, providing femininity with added opulence. 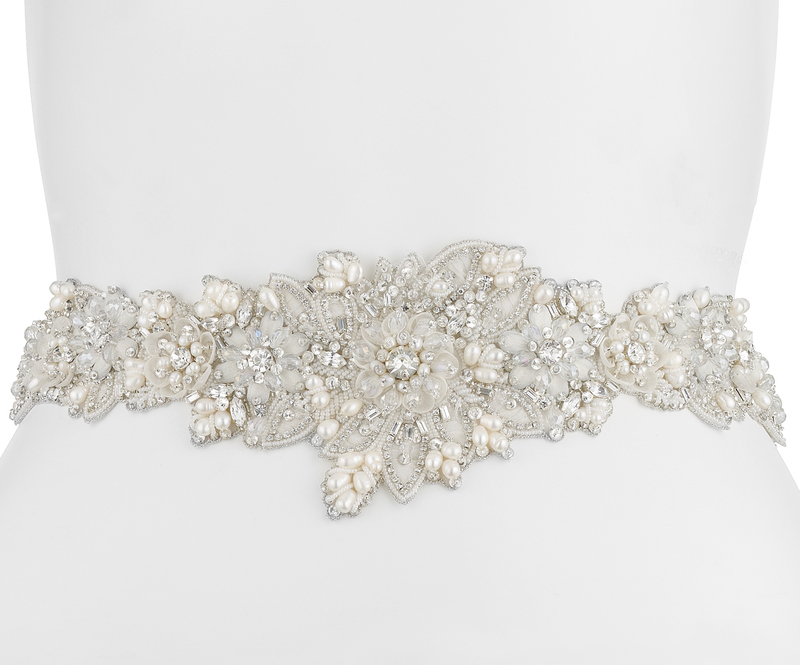 Opulent ethereal details unite with exquisite celestial beading and needlework in this intricate, crystal foliage bridal belt. Mesh amalgamated with flower motifs, translucent beads, pearls and a luxurious georgette sash, deliver an opulent interpretation of a romantic, vintage inspired waistband. Uniting vintage charm with ornate delicacy, LEAH belt hosts enchanting properties ideal for enhancing corsetry and bridal aesthetics. The crystal foliage design and artistic silverwork evokes gracefulness and luxury appeal. 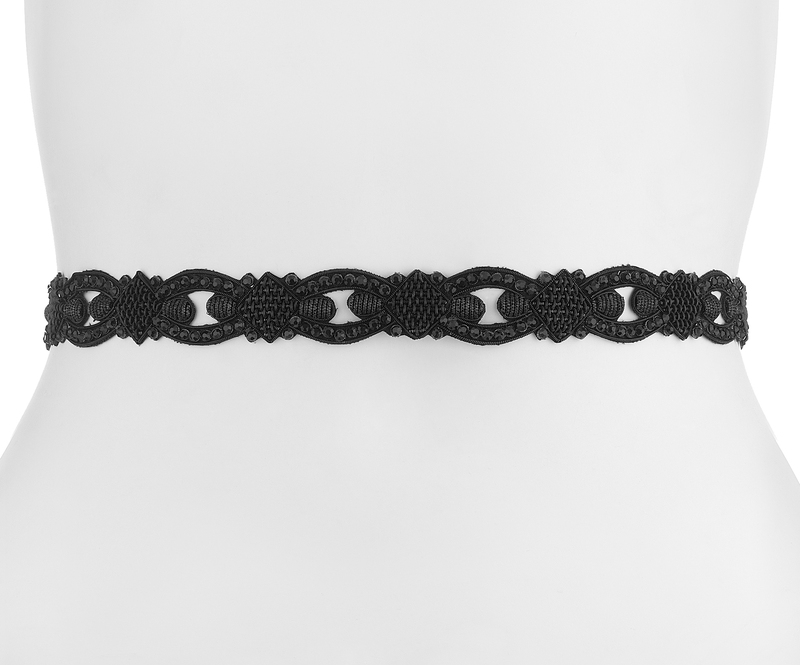 Blending gloss beading with a dark, glamorous aesthetic, this narrow waistband delivers on luxury and opulence. 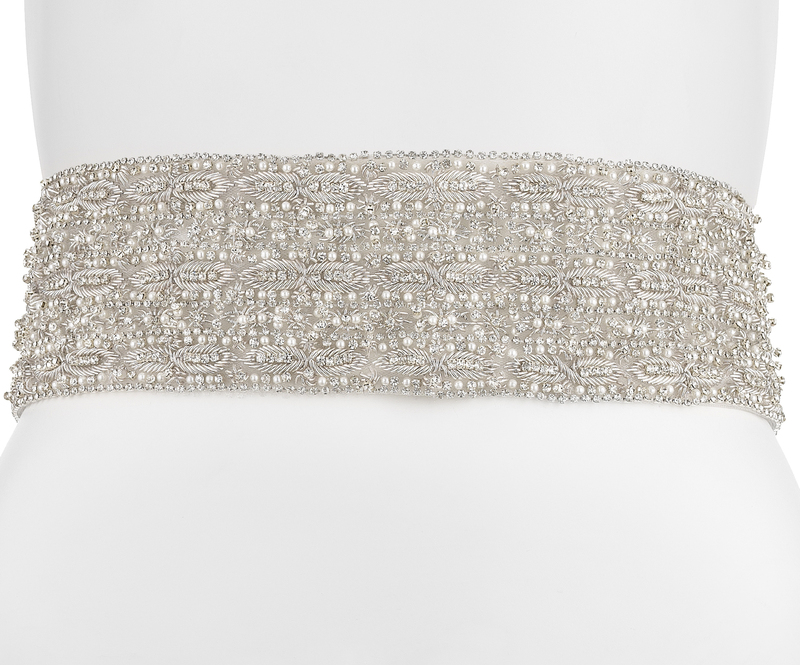 Bewitching beads are perfectly positioned around oval motifs that create a lavish artistic evening belt. Epitomizing grace and glamour, majestic translucent beading is embellished onto delicate crin. Floral motifs are evident amongst crystal clusters and lavish artistry craftsmanship. A hook and bar fastening completes ROSA BELLA’s enduring appeal. 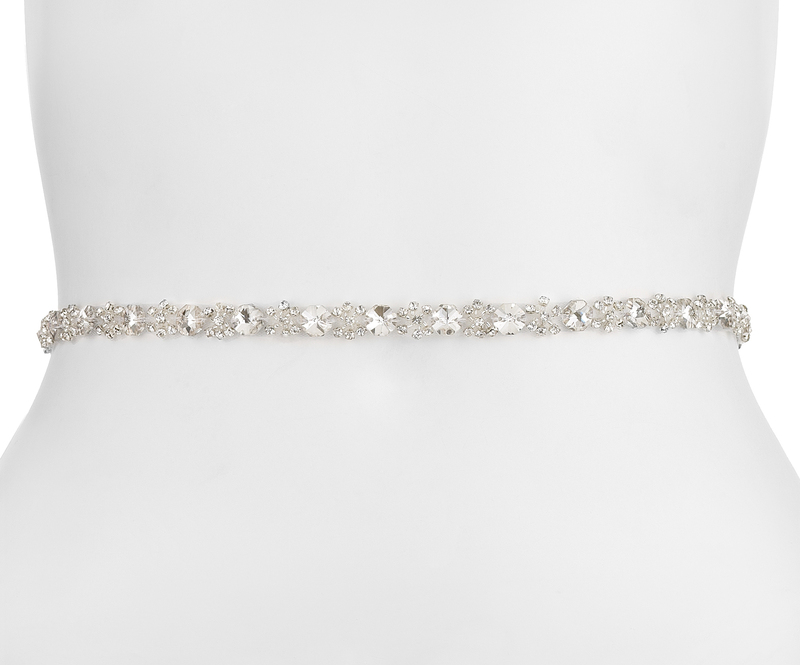 Diamante exquisitely amalgamates with pearl diamonds, luxuriously crafted into an eye-catching majestical belt. Offering an instant way to bring texture, radiance and glamorous properties to your wedding day aesthetic. 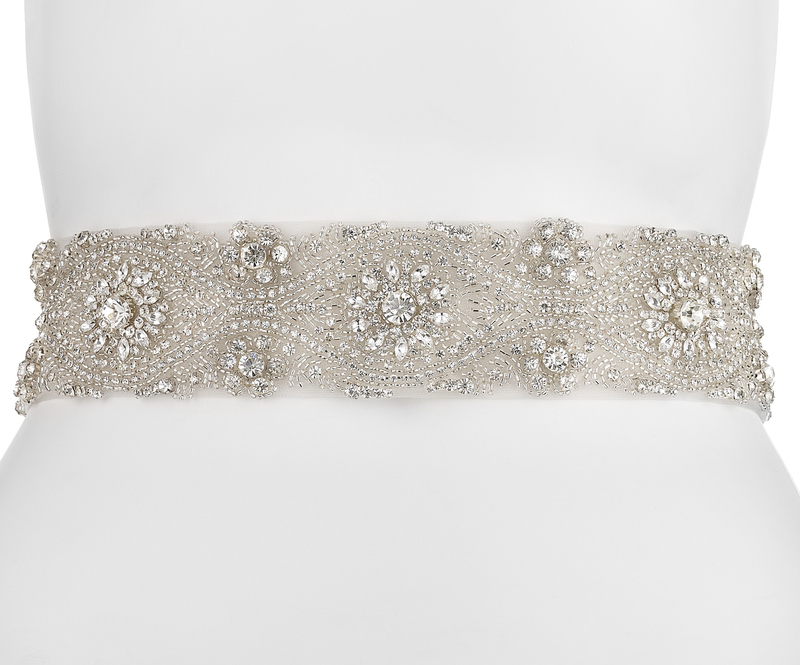 Delicate beading and diamante exquisitely accent this vintage inspired narrow bridal belt. Hosting all the decadent appeal of eras past, this delicate design is meticulously handcrafted into a crystal foliage arrangement, enhanced by its elegant artistry. A plethora of translucent beading clusters over a luxurious 50mm ribbon base, as skilled embroidery produces this powerful, vintage inspired beaded waistband. Opulent in appearance and premium in its handcrafted creation.